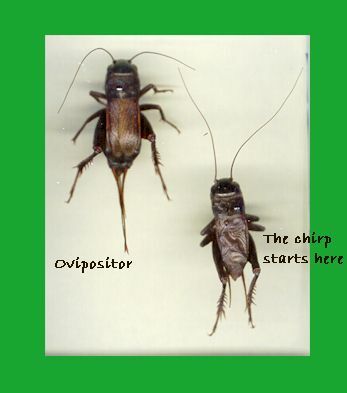 This is supposed to be a birding blog, but many birds eat crickets so that is close enough for us to post the formula about deriving the air temperature from the number of times a cricket chirps. A couple of caveats: You have to isolate a single cricket. If 50 crickets are chirping and you count all of them, you’ll get an air temperature high enough to melt crickets. Secondly, it only works down to about 55 degrees Fahrenheit. Any colder and the crickets don’t chirp reliably. Male crickets do the chirping by rubbing their legs together. They establish territories and attract mates by chirping. It is a great sound unless it is echoing around your bedroom from the rafters above your bed and you are trying to sleep. For that you need a trained cricket-eating bird. Maybe a Greater Roadrunner. This entry was posted on December 4, 2007 at 11:23 am and is filed under Tips. You can follow any responses to this entry through the RSS 2.0 feed. You can leave a response, or trackback from your own site.